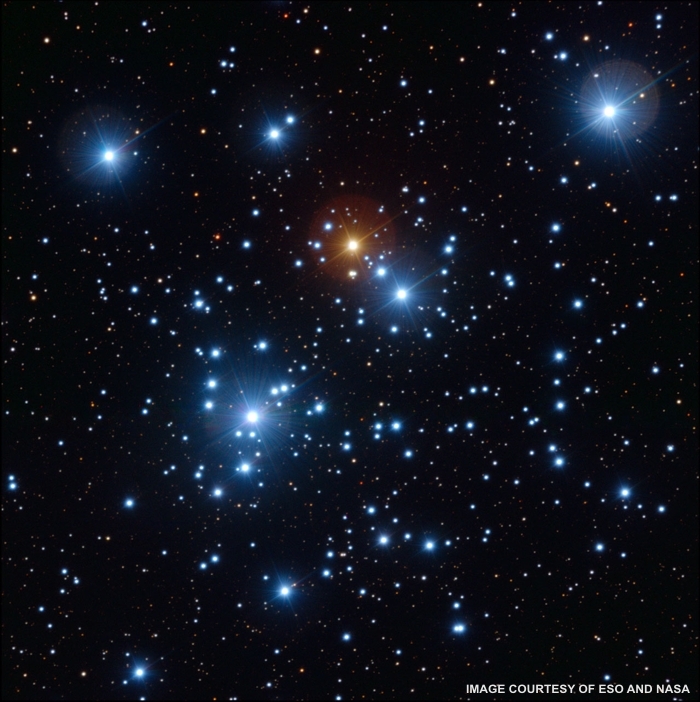 This image shows the “Jewel Box Cluster” (official designation NGC 4755). It’s an open cluster of stars 6400 light years from Earth in the constellation Crux (Latin for “cross”). Crux is a southern hemisphere constellation, and can’t be seen farther north than around latitude 25° N. It was given the name “Jewel Box” by astronomer John Herschel in the 1830s, who thought it looked like a piece of exotic jewelry. The Jewel Box contains over a hundred stars displaying many different colors: blue, red, orange, and yellow are all visible. Blue stars are the brightest, and much larger and hotter than our Sun. Dim red stars are smaller and cooler than our Sun. Some people are surprised to learn that stars have colors — to the casual observer, all stars are just white points of light in a black sky. But if you take the time, allow your eyes to become dark-adapted, and look closely, you’ll see many (pastel) shades. Binoculars will help. See my Oct 17, 2011 post for more about star colors. But I’ll share it with you. The Jewel Box image shows much more than your eyes could see. It’s a combination of images from the ESO Very Large Telescope on Cerro Paranal, the MPG/ESO 2.2-metre telescope at ESO’s La Silla observatory, and the NASA/ESA Hubble Space Telescope, three of the most powerful telescopes in (and above) the world. But the Jewel Box is still a beautiful object when seen under dark skies, especially with a little magnification. So next time you go out on a dark clear night, don’t rush it. Give your eyes the requisite 30 minutes to fully dark adapt, grab whatever binoculars you have, and enjoy the beautiful colors in your celestial treasure chest.